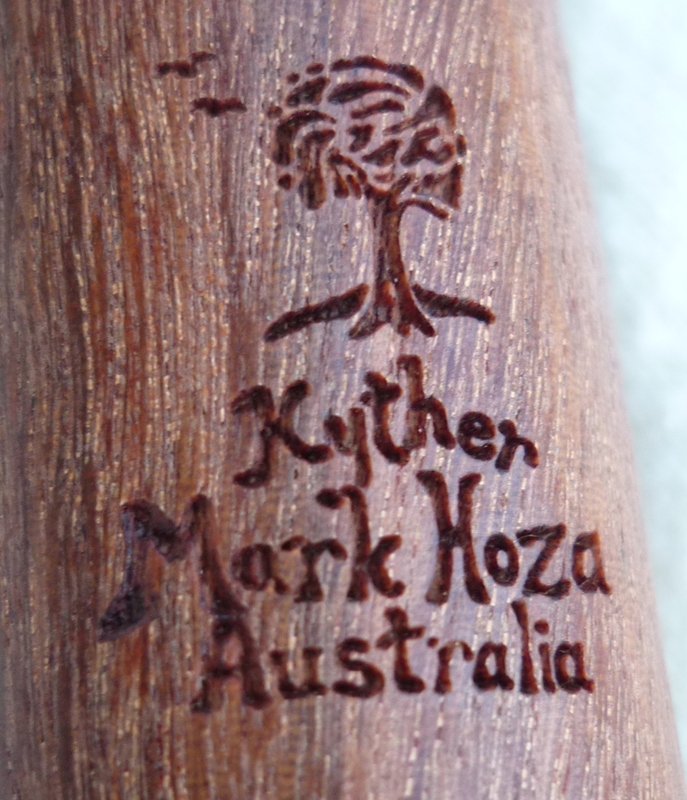 Mark Hoza's Kything Flutes Australia – Wood headjoints, wooden Irish style keyless flutes and quenas. Welcome to Mark Hoza’s Kything Flutes! 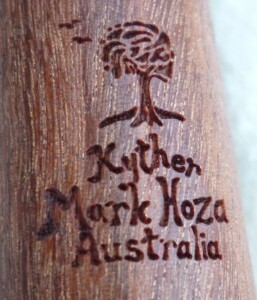 Mark Hoza makes hand crafted wood headjoints for concert flutes and wooden keyless D flutes. Let me know if you’d like to have me make your next flute for you! Wooden, keyless D flutes / Irish style flutes, ideal for playing traditional Irish/Celtic music. Partly modelled after a Prattens Perfected flute, with some necessary modifications to improve stability and to accommodate a short foot design. This model has a notably strong, reedy tone, with a hard low-D. I normally arc the toneholes slightly so that the reach is more ergonomically friendly. I can make the toneholes in a straight line when requested. I have developed my reputation with this model. I have made small changes over the years and consider this my own design “after a Prattens Perfected” to give credit to the original basic design source. Flutes without tuning slides can be tuned to some degree with the tenon-socket joint. 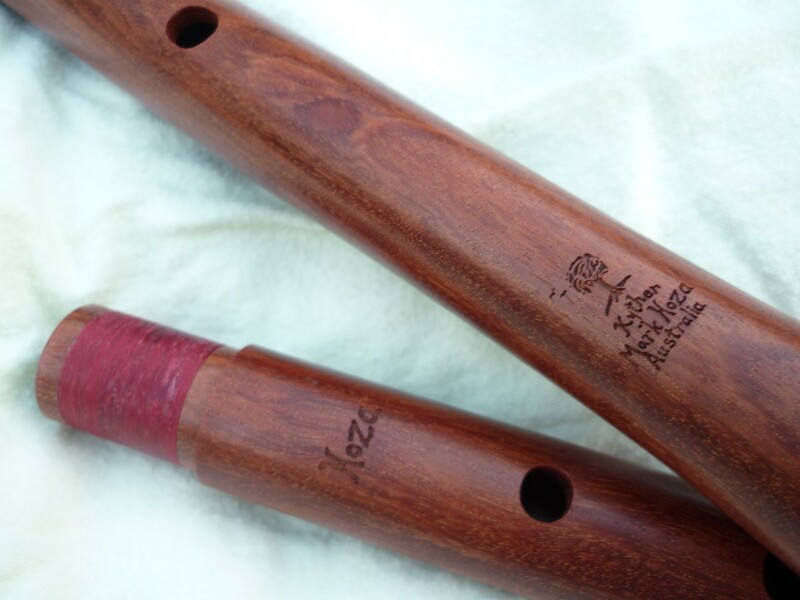 They are tuned to A-440Hz with the head joint pulled out about 2mm, in order to allow for some sharpening (to about A-445Hz when the flute is warm). I make the tenon about 35mm long to allow for some flattening. A tuning slide is recommended if you expect to play with others on a regular basis. I use a Robert Bigio style stopper and end cap design (with his permission). I use a Delrin/o-ring stopper with a ring turned on the face and a small hole in the end cap, thereby creating a resonance chamber in the north end of the headjoint. I also make my flutes with a taller than normal chimney, sometimes with over-cutting on the far side of the embouchure and a recess under the chin. I find that I can get a more responsive flute with these modifications. I effort to make the flute’s tone strong while also giving enough resistance so that it can be driven hard when desired. USD $690 2 joints, without rings. USD $790 3 joints, without rings. USD $950 2 joints, with sterling silver rings. USD $1,170 2 joints, silver rings & tuning slide. USD $1,110 3 joints, with sterling silver rings. USD $1,400 3 joints, silver rings & tuning slide. Add USD $30 for regular air mail (10-15 days) to the US. Add USD $50 for International Courier shipping (2-5 days) to the US. Add USD $70 for a 2 compartment leather case. Add USD $110 for a 4 compartment leather case. 10% GST is included on Australian orders. This is my tuning slide design, but with the old maker’s mark. Cooktown ironwood is notoriously good for those who have sensitive skin and allergic reactions to other types of wood. This headjoint will fit in any Boehm system concert flute. And also give me the make/s and model/s of the flute/s that it will be used with. Due to my removable tenon design this flute can be played with different flutes without having to re-fit the tenon. I can provide more than one tenon if you have more than one flute that you use. Each extra tenon will be an additional USD$66.00. I use a Robert Bigio style crown and end cap design (with his permission). I use a Delrin/o-ring stopper and a small hole in the end cap, thereby creating a resonance chamber in the north end of the headjoint. The stopper has a groove turned into the outer surface of the face. I also make my flutes with a taller than normal chimney, along with mild overcutting on the far side of the embouchure and a recess under the chin. I find that these modifications enhance headjoint responsiveness while maintaining a rich, strong tone in the lower register. In order to guarantee a perfect fit with your flute I will require that I have your flute for final fitting. Otherwise I will get the tenon as close as I am able to, based on measurements supplied to me. If the tenon doesn’t fit your flute exactly you may need to have it sized by a flute technician near you. I use a removable tenon design that allows me to easily swap and change tenons for different flutes. This design makes it possible for you to have different tenons for different flutes that you play, allowing you to use this wood head on all of your flutes! Feel free to contact me via email or phone to discuss details. Thanks to the Internet I enjoy having direct contact with customers around the world! 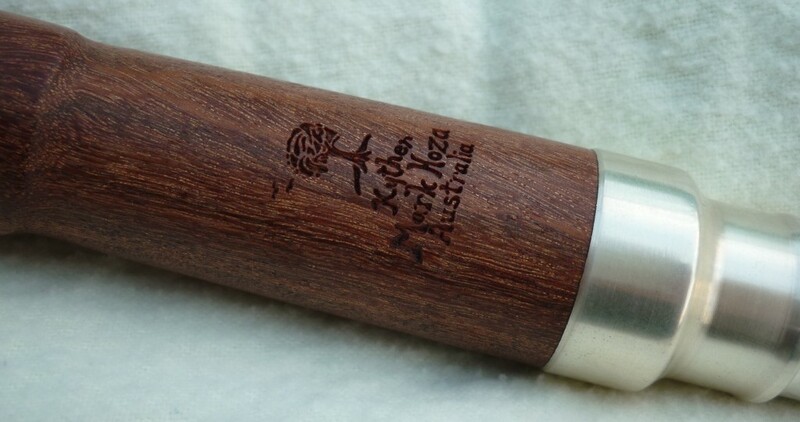 These photos are of a wood headjoint in Cooktown ironwood, an Australian hardwood carefully harvested west of Cooktown, Queensland. This timber is similar to African blackwood in density and gives a superb tone. I also favour this wood for it’s beauty and durability. Cooktown ironwood has also proven good for people who tend to have allergic reactions to other types of hardwoods. Most wood headjoints have a metal tube inserted into the tenon end of the headjoint. The problem with that design is that when the wood shrinks around the metal tube the wood is forced to crack. Wood is always in movement with changes in humidity, such as when the instrument is played regularly versus not being played on a regular basis. This tuning slide design allows for more movement in the wood without causing cracking. The lower ring is a combination ring/socket for the silver tenon. This is a great design because the worst that can happen is that the ring/socket merely becomes loose when the wood contracts. It is easy to then glue it back on. I include a durable pvc carrying case so that the headjoint can be kept in a controlled environment. Wooden instruments require special care and these cases take away a lot of the guess work associated with owning a wood flute. I make the cases with a hydrator so that the wood can be kept hydrated, which significantly reduces the risk of cracking. Each headjoint comes with a protective pvc cannister carrying case to protect your investment from impact and low humidity conditions. The headjoint, cleaning rod and stopper setting tool are nestled in a felt sleeve, which is then rolled up and stored inside the cannister. Price includes freight, protective pvc case, cleaning rod, stopper setting tool and one tenon. Extra tenons for other flutes may be purchased for AUD66 each. USD $1,640 with thinned wall and raised lip plate area. USD $1,400 for the thick wall design. Note: If you send me your flute I will require additional money to cover appropriate insurance and additional shipping for your flute. Full payment is required before shipment. Client is responsible for return postage on returned flutes. I have my own merchant facility for credit card purchases and I accept payments via PayPal. I also accept payment via money order in US or Australian dollars as well as direct bank deposit for Australian orders. I accept personal checks from the US and Australia, but payment must clear before I ship your order. Please write to me at: Mark@WoodenFluteMaker.com if you need more information or if you are ready to place an order.